We have been slacking a bit with the blog but we have been quite busy over here with new friends, Christmas shopping, and finishing up our semester at school. 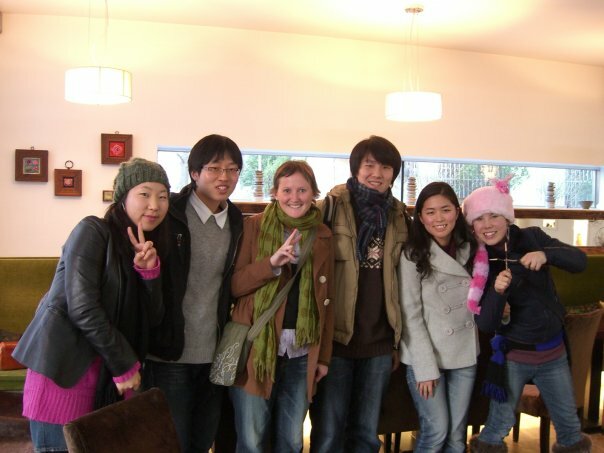 The photo shown here was taken on my day off yesterday when I went and had tea with Han-na and some other friends. A lot is going on so it’s hard to just write about one thing, so here is an update on acupuncture, the elections and a Korean Christmas. Elections: The election here went off without a hitch. No recounts, no fights (at least not on election day), and a new president emerged in a landslide victory despite being dogged by scandal and an ongoing investigation. But, as the New York Times reported, Koreans chose the “bread and butter” issues over ideology. They want their economy to improve. And if that means having a liar as a leader who can boost their economy, so be it. Speaking of elections, we are also keeping up with what’s happening in the American presidential campaigns. I won’t say who we’re voting for (Whit hasn’t decided yet) but we’ve forever got our ears tuned to what’s happening at home. Korean Christmas: “It’s not a big deal in Korea,” one student explained to me. That same student almost passed out today when he heard that “Santa” puts candy in stockings (GROSS! SOCKS?) for children in America. I had never thought of it like that. But that is a little weird. Why socks? Despite Christmas not being a big deal here, we are still getting a small taste of it. We came across some Christmas lights, which we hung up in our apartment. The small fake Christmas trees cost a small fortune so that was a no-go. But there are lights up everywhere downtown and a giant Chrismas tree display of lights in the center of town. But no worries, I am bring a little bit of holiday spirit to my students. We are having a Christmas party on Monday (Christmas Eve–yes we will be at school!) I am even thinking about buying little socks to put candy in because they were so funny about it today. But the best part of our Christmas will be Mom & Dad’s visit. In case you didn’t know, they will be arriving at 6 a.m. Christmas day in Seoul! We are so excited and have practically planned every minute of the trip. We’ll be touring Seoul, Gwangju and Gyeongju (a city known as a “museum without walls” for all its beautiful ancient Korean temples). They will also be visiting my favorite class, who cheered and clapped today when I told them. “Are they old?” they wanted to know. That should be a lot of fun. No worries, we will post pictures. Well, I’m off to stare at the TV and try to forget I made a girl cry today at school. Ughh. Kids.